Represented by a pair of fish, Pisces is the final sign in the Zodiac. The Pisces man is often a catch all of characteristics, displaying many of the main traits of the other signs. He is generous and unworldly. The inner journey, the spiritual quest, and the emotional realm are what the Pisces man's general focus. The emotions are what define this man. This sentimental emphasis also means that he is highly intuitive and he is able to sense what others are thinking or feeling almost telepathically. Speak to a Pisces man and you will often feel like you are having a conversation with someone who's living in two different worlds. His mind will be half in this one and half in the other. The illusory world of dreams, shadows, and secrets is as valid to the Piscean as the reality of this one, sometimes more so. Ideals, ideas, and the imaginary – a Pisces man espouses these above the more ordinary reality of physical sensation. This inner focus of the Pisces man makes him mysterious and enigmatic to many people. It is hard to dig down to what he's really thinking or feeling and he does not betray his own confidences lightly. Both adorable goldfish and predatory shark, a Piscean often displays a duality in his personality. Epitomizing his water element, he is fluid and easygoing, always swimming with the current and going with the flow. Like any current, this relaxed approach often belies a deeper underflow. The calm, collected facade of a Pisces man often hides his passionate and sensitive inner turmoil. He possesses a strong and vivid imagination, expressing his thoughts through writing, dance, or song. Extraordinary and creative, the Pisces man is often found making a splash in the arts industry. Famous Pisceans include great thinkers, artists, actors and visionaries such as Nat King Cole, Albert Einstein, Renoir, Kurt Cobain, and Bruce Willis. Although there is plenty of fish in the sea, if you manage to hook a Pisces man, this is a catch that you probably won't want to throw back. Dreamy, compassionate, and helpful, the Pisces man loves to cater to his partner's needs. He will think up delicious surprises and treats for a partner, and a simple word of kindness or thanks is enough for a Piscean to feel appreciated. Relaxed and placid, the Pisces man makes for an easygoing partner. He will be faithful and loyal to his mate. The quiet and unassuming Pisces man is a flash flood of passion in the bedroom. He loves fantasy and role playing. Games in between the sheets are his specialty and he is a creative, generous lover. He is sensual, surprising, and seductive. Again, don't judge the Pisces man by his gentle outlook – still waters run deep. In this case, still waters run to a whirlpool of desire with the Piscean who has had the flood gates unlocked. His intuition and eagerness to please mean that the Fish has a Casanova-like skill to give liquid, intense love satisfaction. He is generally considered most compatible with Cancer, Scorpio, Taurus, and Capricorn. See also Sun sign compatibility. However, there is a lot more to compatibility than only the comparison of the Sun signs. For example, how do your Venus signs compare? Find out Venus signs here. Discover Venus sign compatibility here. Uniquely perceptive, this man's understanding of people makes him popular within his social circles. The easygoing and selfless Pisces man has friends from all walks of life, all personalities, religions, and ethnic origins. This Pisces man can be emotional and compassionate, but never mistake these for signs of weakness. In fact, these are strengths, and if you stick around long enough, you'll discover exactly how this is so. The handling of money isn't always this man's strongest trait. As perceptive as he can be, the Pisces man can also be impractical and find himself making financial decisions based on emotion rather than common sense. Easily influenced, the Pisces man must be wary of those who are trying to sell him financial advice, insurances, properties, or get-rich-quick schemes. The Pisces man can get caught up in the moment and let rational thinking escape him. Money may not mean all that much to the Pisces man, but he does know how to stretch a dollar when he has to. Represented by fish, the Pisces man will favor turquoise – the color of the sea. Shades of this color might be found in his wardrobe, jewelry, interior decorating, and home accessories. The Pisces man is well aware of the latest in men's fashion, so you will see him sporting the current styles in clothing and footwear. Leaning toward the impractical side, this man tends to acquire more than he really needs and will often buy on impulse. A Pisces man is loyal to friends and family, putting their well-being before his own. He is an empathetic gentleman who can present sympathetic viewpoints when asked by friends and family – and they generally take advantage of this trait, too much so in many cases. 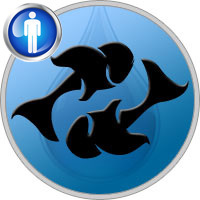 Even though he doesn't normally jump into the role of leader, the Pisces man possesses a powerful, yet restrained disposition and is often called upon by friends, family, and co-workers to lead them through a crucial situation. Often called a daydreamer, nevertheless the Pisces man is always there when needed! Love and the Pisces man is like a summer storm - going from the warmth of a welcome rain, through clashes of thunder and lightning, then to the calm tranquility of its aftermath. He gives everything when it comes to romance and holds nothing back. The emotional intensity of a Pisces man can make him susceptible to headaches, but they could also be a result of some overindulgence. Too many late nights, a second trip to the buffet table, and that extra drink can all play havoc with this man's health and contribute to his sometimes low levels of energy. Moderation and exercise are two words often ignored by the Pisces man, but when practiced, contribute solidly to his well-being, both emotional and physical. The corporate world isn't a place for the Pisces man, so forget a normal nine to five office job. This man needs to use his creativeness, and when allowed to do so, will devote himself wholly to the tasks at hand. It would be worth it for the Pisces man to consider careers as a counselor, writer, musician, detective, social worker, or architect. Kind-hearted, considerate, and ruled by the Zodiac sign of two fish, the Pisces man may find his calling as a veterinarian.